Thankfully, as in most things, my perspective shifted over time. 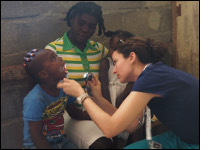 As the days passed I was able to refocus my efforts onto the patients themselves by providing reassurance to parents of well children, nutrition counseling to new diabetics, and education to young women for first pregnancies. I still doled out medications for impetigo, tinea, and scabies. I still handed each patient a bag of multivitamins and a dose of deworming medications. And I still gave out short-term supplies of antihypertensive and analgesic pills to those with chronic illnesses, clinging to the hope that the next team would provide the necessary refills as more permanent medical care was built up in the region. I didn’t understand immediately, but the most impactful things we left behind in Cap Haitien and the rural communities along the northern shore were not “things” at all. Yes, those were all helpful in small or even big ways, but the real lasting impact was made up of time and of words. Knowledge is power, and the education provided to the people is, in my mind, our true legacy in Haiti.